Looking for outdoor display equipment to showcase the menu of your restaurant, cafe, pub or bar? Scribo Displays offers slim menu cases with magnetic and dry-wipe back panels that can be used to display printed menus with LED illumination. 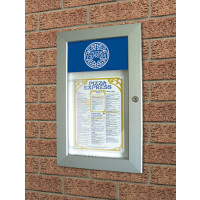 These attractive and cost-effective menu cases are available in four sizes. Our slim menu cases have aluminum frames with doors that stay fitted to the frame. The tamper-proof glazing panels on the front of these slim menu cases help to protect the printed display material from the impact of extreme climatic changes. Our slim menu cases also come with magnetic pins to attach posters and complete sets of keys to ensure the safety of the printed menus being displayed. We invite you to browse our catalogue of slim menu cases, so you can select the ones that suit your requirements.